ATHENS/BRUSSELS (Reuters) - Greece and its European creditors on Tuesday sought to play down fears that Athens would default on a payment to the International Monetary Fund next week. Running short of cash to pay public sector salaries, pensions and debt obligations, senior members of Prime Minister Alexis Tsipras's government have said openly that Greece does not have the money to pay 300 million euros to the IMF on June 5. The threats have spooked financial markets, which fear a default could forces Greece out of the single currency, pushing the European and global economies into uncharted territory. Still, the government on Monday reiterated that it would try to make the payment and Finance Minister Yanis Varoufakis expressed confidence a deal with lenders would be struck in time to avoid default. Asked if Athens could make the payment, he said: "Of course, because there will be a deal by June 5." The comments drew a positive reaction in Germany, Greece's biggest creditor and one of its toughest critics in long-running aid negotiations with its EU and IMF lenders. "I find it encouraging, if it is true, that the Greeks signaled yesterday their desire to repay the 300 million euros to the IMF on June 5," a German official said. "I think there is reason to believe that we will not be talking about a default situation around June 5, neither before or immediately thereafter." European Commission President Jean-Claude Juncker - who has been in close contact with Tsipras through the slow-moving talks - also expressed optimism that Athens would pay up in time. "My impression after talking to a series of colleagues is that the feeling is growing that a default should be avoided," he told the MNI news agency. Asked how a default would affect the negotiations, he said: "The Greek colleagues have to know that we think they have to pay in June." 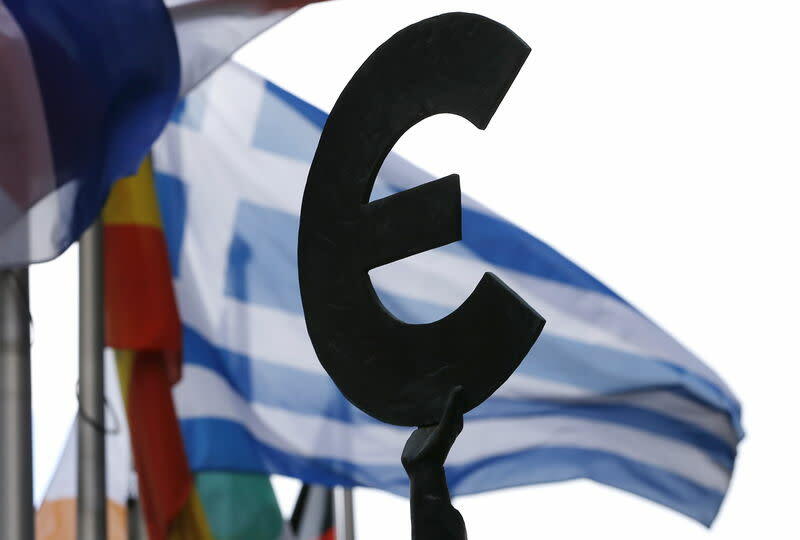 Reflecting the slightly improved mood, a survey of mostly German-based investors showed the probability Greece leaving the euro zone in the next year has fallen to 41 percent in May from 49 percent in June. The June 5 payment is the first of four loan instalments totaling 1.6 billion euros ($1.76 billion) due to the IMF next month, and the date has turned into the next crunch point for Greece's fast-depleting cash reserves. Greece could win more time to negotiate a funding deal without defaulting if it lumps together all IMF repayments due in June and pays them at the end of the month, euro zone officials said, but Athens has ruled out such an option. Shut out of bond markets and with bailout aid frozen, the country says it is running out of cash and would prioritize paying civil servants and pensioners over the IMF if it is forced to choose. Talks between Greece and its creditors on more funding have been dragging on since late January, when Tsipras took power on promises of ending austerity and reversing reforms agreed with the creditors by the previous government. A new round of talks with the so-called Brussels Group - the trio of IMF, European Central Bank and European Commission lenders - was scheduled to start on Tuesday but was postponed till Wednesday for "technical reasons", a Greek official said. Officials said euro zone deputy finance ministers will hold a teleconference on Thursday to follow up on the negotiations, though there is no expectation of a deal by then. The talks have foundered on Athens' insistence to roll back labor and pension reforms and lower the primary budget surplus target as well as creditors' demands for value-added-tax hikes. The European creditors could accept 1 to 1.5 percent as a suitable primary surplus target for the year, but Athens would need to take additional budget measures to reach the goal, one euro zone official said. "The process is much better, the substance is improving but we're not there yet," EU Economic Affairs Commissioner Pierre Moscovici told journalists in Dublin. "We are aware of the liquidity problems in Greece, this is why it so important that the negotiations speed up." Adding to the confusion, Greece's finance minister initially said Athens was considering a small levy on bank ATM transactions to encourage the use of credit cards but hours later the finance ministry said the proposal was no longer being discussed.